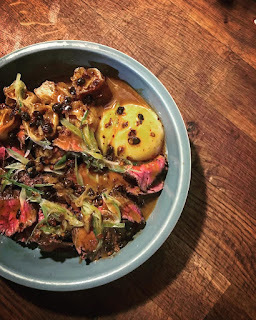 TĀ TĀ Eatery, who serve small plates with both Asian and Portuguese influences, are back for a 3 month residency at Borough Wines in Station Terrace, Kensal Rise, NW10, serving Thursday to Sundays, starting 10th May. Go for dinner on Thursday, Friday and Saturday, or brunch on Saturday and Sunday. TĀ TĀ get extraordinary love on their instagram make sure you go to get a taste! "Zijun Meng and Ana Goncalves from TĀ TĀ EATERY are taking over the kitchens at Borough Wines Kensal Rise, for a three month residency as part of our Chef Development Series. Stop by for small plates and sharing platters, including the famous Katsu Sandwich and Toasted Rice Cream. Looking both east and west for inspiration - with a nod to their native China and Portugal - TĀ TĀ dishes are Modern Asian in style, but incorporating European ingredients and techniques, all cooked with flair and precision." Note - It's cash only - except for the bar - but there are cashpoints nearby.